The latest installment from Focus on the Family Radio Theatre is now available for purchase. 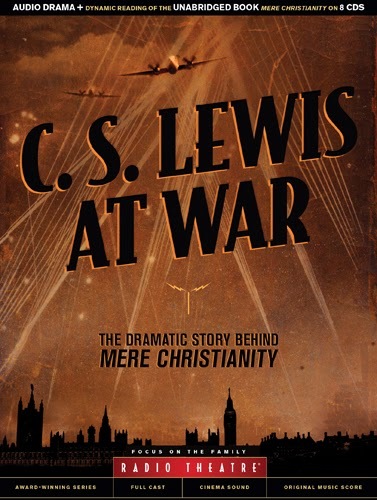 It is called C. S. Lewis at War: The Dramatic Story Behind Mere Christianity. Writer Paul McCusker takes the listener behind the scenes of Lewis' life during the era of World War II while also delving into the atmosphere in England which led C.S. "Jack" Lewis to deliver nationally broadcast radio addresses via the BBC. These talks then later were published collectively in book form under the title Mere Christianity. 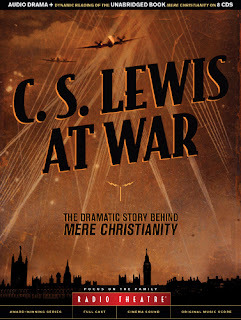 You can purchase C. S. Lewis at War: The Dramatic Story Behind Mere Christianity at Amazon.com, ChristianBook.com or iTunes. The CD copy also includes an audiobook version of Mere Christianity. You may also be interested in the book, Mere Christianity which is also available at Amazon.